When three criminals decide to hide out in a warehouse while trying to evade the law, they soon discover that they may have trespassed on the wrong property. When they find the remnants of a deceased man and a room full of decomposing dogs, they soon realise that the law that is closing in on them from the outside, may not be as deadly as whats roaming within the walls inside of the warehouse. 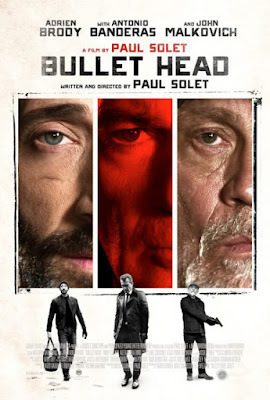 While listening to one of my favourite horror podcasts, they talked about Bullet Head in passing. They had stated that the director was a close friend and that they finally got around to seeing it, which they had described as a lot of fun. I had no reason to doubt these guys. They are usually on the money. When you tell me that a movie is about a killer dog inside a warehouse, hunting and preying on unsuspecting victims. I'm sold on that film. Cujo, Man's Best Friend, etc. They all hold a pretty special place in my heart. Looking at the poster for the film, it gives you no indication whatsoever that this is a story about an enormous killer dog inside a warehouse trying to maul several people. This appears to be like one of the many B-Grade, Americana Gangster Crime movies that litter those shelves of your local shopping market bargain bin. For the most part, this is just that. It has that crime film element, but this has a twist involving the killer dog. It's a shame they don't use that element more in the film. I put Bullet Head on while I had a group of friends over. I told them, I believed it was a horror-adjacent movie about a killer dog that hunts a group of criminals down in a warehouse. They all sounded relatively keen to watch the carnage unfold. At various times throughout the first forty minutes, my friends were asking me, "When does the horror start?." On IMDb, this is listed as a crime thriller, and I think hearing them talk about this on a horror podcast, I thought this was going to be more in line with those 'Animals Attack' films. The first big issue that I have with Bullet Head is that it's just not that fun. Of course, the people on this podcast are going to praise it as it's made by a friend of theirs. It's hard to be harsh on a movie when it's directed by a friend. The pace of the film feels plodding. The first half of the film, barely anything happens. Here you have managed to secure an Oscar winner and a twice Oscar-nominated actor, and all you have them do is stand around in an empty warehouse, arguing with a third actor who isn't even in the same league as them when trying to share the screen? I just didn't enjoy any of the dynamic here. We also have Antonio Banderas in the villain role. The man who owns the warehouse. The one who has apparently been using the warehouse as a dog-fighting ring. With a name like Blue, he is not happy that these criminals have taken up refuge here. When he comes into the story in the third act, it's a scenery-chewing performance. You have him going up against Adrian Brody and John Malkovich who are trying their hardest to keep this story afloat, and it becomes a weird mix of shootouts, evil dog chases, and a battle of wits. It all feels a little too late. My favourite aspect of Bullet Head is the cinematography. When you're filming inside a warehouse that is filled with rubble, you really don't have much to go on regarding a colourful aesthetic. This has a very cold and brutalist look and feel to it. Luckily, for the audience, we get to witness a lot of excellent camera work. There are the swirling camera shots when a character goes into a drug-induced stupor. We have underwater shots as bullets fly around a person. A dog hunting a man who is hiding atop a piano while the camera lingers above him. I can't fault the look of the film. This looks very well made. For me, I think what would've made this film more enjoyable was if they added more of the killer dog. I actually think it would've benefitted the story more. What we get is a crime film with a subplot featuring a vicious dog that isn't used nearly enough here. I think had they gone all out and just delivered a story about three criminals trying to survive a killer dog, and lent itself more to the horror genre, I think this film would've been a more enjoyable ride for me personally. Some people may enjoy the melding of crime film meets when animals attack story. Lastly, when it comes to the gore and violence, I felt that the movie was restrained when it came to the attack scenes. We get aftermath shots that appear bloody, but we don't ever really get to see the attacks themselves. The most gruesomely bloody of the attack scenes in the movie comes just before the credits begin to roll. I would have relished if the film had been just an absolute vicious dog attack movie that gave us buckets of blood. If you don't like violence against animals, you may find some of the scenes quite distressing here. - A man's body is found after being attacked by a dog. - We see a man follow blood down a hallway. - A dog chews down on a man's arm. - A dog is killed off-screen during a dogfight. - We witness several dead dogs in a mass grave. - A dog dies after being shot. - A man's throat is torn out by a dog. - We see the aftermath of a man who has been killed by a dog. 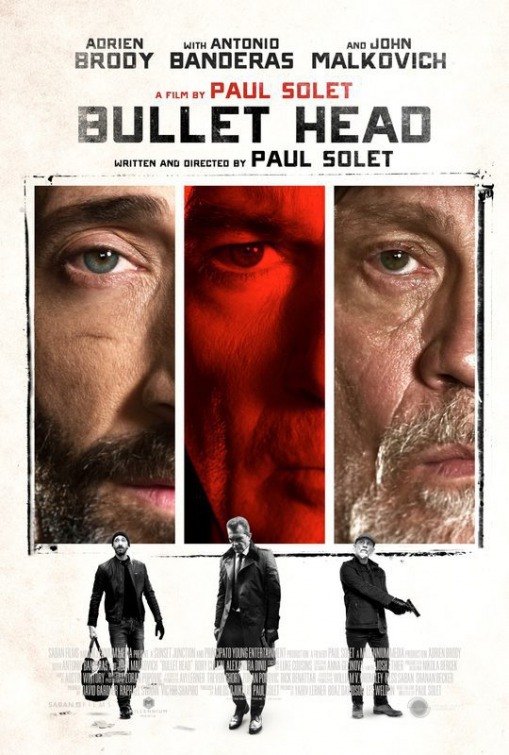 Bullet Head feels like a missed opportunity. While the film has a renowned cast, some emotional heft towards the third act, and some excellent cinematography and camera work. It's sadly not enough to save the movie. For a good portion of the running time is just incredibly slow-moving. It feels like not a lot happens here. Maybe, I just went in expecting a killer dog movie and got something different to what I was anticipating. A crime movie with elements of when animals attack. I just wish I'd been given more canine and less crime. Labels: Thriller: Suspense, When Animals Attack! Copyright © Schlock Horror. Awesome Inc. theme. Powered by Blogger.